On Wednesday, April 2, 2014, Mayor Stephanie Rawlings-Blake announced the 2014 African American Festival Musical Artist Performances and Experiences. “We are truly making Baltimore a key destination for people on the East Coast. From our ethnic celebrations to our arts festivals and other tourist attractions, we’re giving people a reason to visit and move to Baltimore”, said Mayor Rawlings-Blake as she began announcing this year’s event. Mayor Rawlings-Blake was joined by event producer Shelonda Stokes, President and CEO of greiBO Entertainment along with this year’s festival presenting sponsor, Earl “Butch” Graves, CEO of Black Enterprise. 2014 festival sponsors and supporters were also on hand for the announcement of this year’s festival event, activities, and entertainment for the 2014 African American Festival. 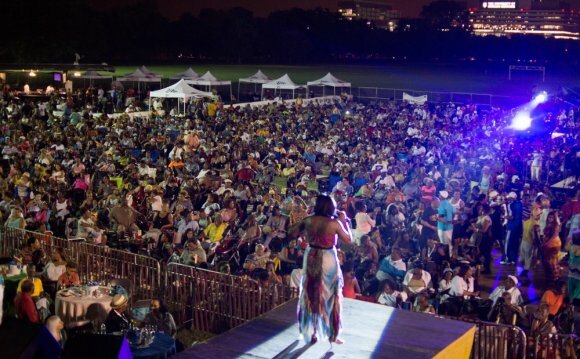 Spectators were on the edge of their seats as Mayor Rawlings-Blake announced musical performances by R&B Divas Star Monifa, Chico DeBarge, the multitalented Jacob Latimore, and the rock-based funk band Mint Condition on Saturday, June 21. On Sunday, June 22, we are bringing back Gospel with the Choir Boys, and Preachers of L.A. star Deitrick Haddon. Sunday evening the soulful R&B crooner Johnny Gill takes the stage, and Grammy Award winning artist Brandy will close out the festival. More talent will be announced as the festival draws near. In addition to the exciting festival entertainment, Mayor Rawlings-Blake also announced the return of the air- conditioned experiences like a Health, Wellness & Access, presented by Evergreen Health which includes health screenings, fitness demonstrations, and nutrition seminars.